We went out of town over this past weekend so that I could be with my daughter and grandkids to celebrate my birthday this year. Sometimes we go there and sometimes they come here. It only matters to me that we get to be together and celebrate. My youngest grandchild, Alexander, is 4 years old right now and reminds me so much of his momma at this age. He was waaaay too cute Sunday night as were were heading home after Birthday Dinner at Babe's Chicken Dinner House in Frisco, Texas. I always want fried chicken on my birthday and this way, they have the mess and the clean up. They serve family style which is also very nice. So anyhow, we were going back to the house after dinner and Xander pops up and says, "Mimi, can you tell me how to spell 'Dear Mimi, We had a good time'" as he wants to send me a text that says this. It melts my heart for sure. He has his daddy's old phone and he thinks he is sending a real text. How cute is that? While I get back into my groove on the blog, I cheated a little for today's card. I'm using a recent design to create my card along with some previously stamped Tulips from Tulip Time that used Lovely Lady, Hibiscus Burst and Raspberry Fizz inks for the blooms and Vintage Jadeite with Mowed Lawn Distress Ink for the leaves and stems. Essentially all I had to do was to assemble everything. 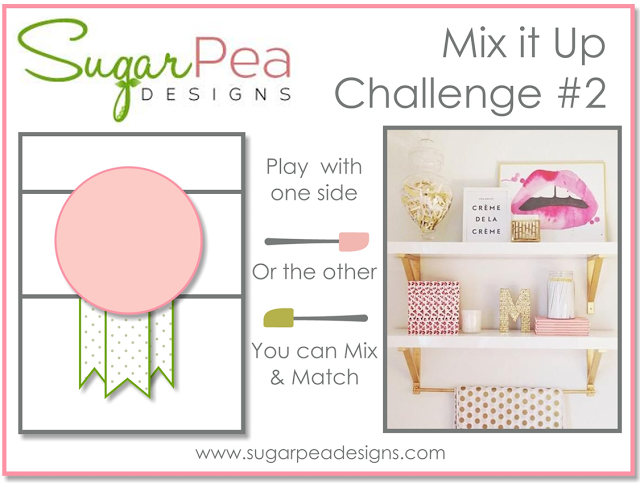 The Challenge over at Sugar Pea Designs #2 is a Mix It Up Challenge where you can use the image or the sketch or both. I chose to use inspiration from the photo which calls for a combination of pink and gold — one of my favorites. I cut the pink and gold foiled paper with the largest Simon Says Stamp Stitched Rectangle then began assembling the rest of the pieces on a top folding A2 card base made from Stamper's Select White. I used the same pieces as I did previously; the Simon Says Stamp Exclusive Smile Circle Die, the Circle (Window) Die from Stamp-A-Faire 2014 Renaissance Kit, and the Impression Obsession Butterfly. Once I had the card assembled, I just "had to" go ahead and add a golden butterfly to go with all the pink and gold on the rest of the card. I also had a short length of ribbon that was a very pale pink and green so I inked up the pink side using a Hibiscus Burst Ink Cube then tied a bow from it and attached that to the flower stems using Glossy Accents. I could also have used a Copic Marker to color the ribbon, but my ink pads were sitting right there. I wanted this card to go out in this morning's mail so I got it photographed really quickly and in the outgoing mailbox already. Anytime you can use a basic design more than one time, I think it's a winner. I always stamp a few extra tulips whenever I get the Tulip Time Stamp Set out so if I need to pull a card together quickly, I can. This paid off for me yesterday as I realized I needed a card to send to someone in particular. Thanks so much for stopping by today. Have a great week. I'll be back with a new project very soon. If you'd like to leave a comment, please feel free to do so as I enjoy reading them all! Vicki , sounds like you have been having fun with the kids, one of my favorite things to do too! Oh my goodness this is one stunning card! Wow and more wow! Beautiful card! I love, love, love those tulips! 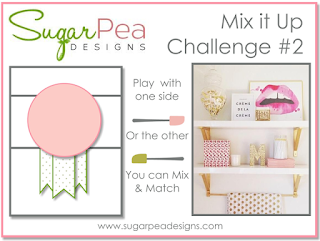 Thanks so much for joining us at SugarPea Designs.